After a long weekend, it’s a good idea to get back into the swing of things by catching up on what you missed! 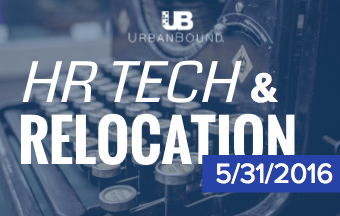 That’s why we’re here with the top HR tech and relocation news from the past week — all in one convenient spot. Don’t miss out on all the expert insights, statistics, and perspectives. We know that an employee relocating for their job with their family in tow will deal with extra stress throughout the process, face different obstacles during the acclimation period, and have to make different types of decisions. This week, the Huffington Post sheds light on employee relocations that include a relocating family as well: Creating a Less Stressful Workplace: A Guide to Successful Employee Relocation and Increased Productivity. Despite being able to speak the native language, relocating employees (and especially those in leadership roles) that are moving to a foreign country need to keep local culture top of mind. What may seem completely normal in one country, can be confusing or even (worst case scenario) offensive in another culture. UrbanBound had the honor of being “Highly Commended” by the 9th annual Re:locate Awards in the category for Technological Innovation. The awards were led by Fiona Murchie, managing editor of Relocate magazine, in the beautiful city of London. In her article, Relocate Awards - the future of global mobility, Murchie discusses the constantly evolving landscape of global mobility (how it's becoming more than a niche industry) and touches on what the future holds for all of us.